It seems that the world is starting to pay attention to the fact that our bee populations are declining. More people are recognizing the problem, and many of them want to do more than just talk about the problem. They want to get out there and raise their own bees. If this sounds like you, then I want to say, "Thank you!" Thanks for taking a step in the right direction. But before you run out and order a bunch of bees and equipment, there is a very important question that I would like you to consider. "Which bees are the right bees for you?" There are more bees in your backyard than you might think. Here are just a few. I have asked many people that question, and more often than not, their response is one of confusion. Perhaps they didn't even know that there was more than one option. So let's clear things up, shall we? First and foremost, you be aware that there are 20,000 different species of bees, and here in the United States it is possible to find all the tools and information that you need to raise at least 3 different types. Specifically, there are honeybees, spring mason bees, and summer leafcutter bees, all of which can be successful here. But which is the right type for you? To figure that out, the first thing you should consider is your goal. What you are trying to accomplish? Are you raising bees because you have heard they are in trouble and you just want to help? Are you an avid gardener looking to increase pollination in your own yard? Are you looking for a way to produce income from your bees? Do you just love honey and want to have buckets of it all to yourself? Do you have a family heritage that is leading you toward beekeeping? Depending on your answers, the type or species of bee that I would recommend will be very different. It could even be a bee that you didn't know existed before you started reading this article! Various versions of "save the bee" are found everywhere. In this photo, the words "save the honey bee" appear on one of my beeswax lotion bars. For the person who is simply wanting to help our struggling bee populations, there are a lot of means to that end, raising bees being just one of those means. What it really comes down to is which bees need our help the most. When we hear the phrase "save the bees", most of us get an image in our mind's eye of a cute little honey bee that desperately needs our help. But the fact of the matter is that native bees need help, too. Our native bees (mason bees, leafcutters, bumblebees, mining bees, and many others) are impacted by the same issues that plague the honey bee, such as loss of habitat, loss of food sources, and damage from pesticides and diseases. On top of that, the honeybee gets the majority of the attention, leaving our poor native bees with few to defend them. And yet, they are not only just as important as the honeybee, they may actually be more important. After all, the honeybee is a European import that arrived here in the early 1600's. Before that, all of the pollination in this country was done by native bees. And yet, they are often ignored and sometimes even scorned (by those whose livelihood is based on the honeybee). So who needs our help more? I would say the native bees win this round. A Blue Orchard Mason Bee pollinating cherry blossoms in Lynnwood, Washington. For those who are looking to increase pollination, honeybees seem like the obvious choice. Most traditional beekeepers today make less than half of their income from selling honey. Their income comes from renting their hives to farmers to pollinate their crops. They travel to California to pollinate almonds, to Washington to pollinate cherries and apples, to Texas to pollinate squash, and so on. Logically, if that's what the commercial guys are doing, then we should use the same kind of bees in our own yards. Well, not so fast... Most of us are looking to boost production in our own yard, not on acres upon acres of fruit trees. If you place a hive in your yard, the honeybees will travel long distances, sometimes as far as 2.5 miles away, collecting pollen and nectar. They don't stay confined to our backyards. Compare this to a spring mason bee, which stays within about 300 feet of it's nesting site. You are more likely to see a personal benefit with the native bee. Not only that, but our native bees are better pollinators than honeybees. They specialize in a type of pollination that a honeybee isn't able to replicate called "buzz pollination" and it is essential for certain food crops. Add to that the fact that our native bees only collect plain, dry, pollen - no nectar. This allows the pollen to fall away as it is carried, spreading easily, and that results in higher pollination rates. So why does anyone even bother using honey bees to pollinate? Because that's the way we've always done it! Very few will commit to trying a new way until it has been proven that it will be successful for them. And that will take time. But you can be one of the pioneers in your area by bucking the honeybee trend and embracing better pollination with native bees. A swarm of honeybees. These came from one of my hives, thankfully landing in a neighbor's tree and not somewhere inside his attic. Maybe you just love bees, and you are hoping to earn a little extra money from some hobby level beekeeping. Or you could have a desire to run a full time business devoted to bees. For you, the answer comes down to how much time, effort, and money you have available to make that happen, and whether or not you can handle the physical requirements of the job. I won't lie to you - honeybees are hard work. I compare the commitment level required to a romantic relationship. With native bees you are just dating. You spend a little time, you spend a little money, you love every minute of it, but you can spend your time elsewhere and not get into trouble. With honeybees, though, you are married. Until you die. And even though you love them, you will get angry from time to time and fight. You will even get stung. But if you are willing to put in the time to make things work, it can be a beautiful thing! It's silly, I know, but it's the truth. Selling honey at the Bothell Farmer's Market accounts for a major portion of my income. Selling honey is one way that I produce income, and it's not an insignificant portion of the total. But I also spend far more hours dealing with my honeybees than I spend doing all of the other various business things that I do. In the summer I spend several hours per week checking on my hives, more if a swarm urge strikes. And, of course, there is the time invested in the honey harvest! In the winter the bees come out rarely so you would think there is less work. But in reality, that's my only chance to catch up on repairing equipment, cleaning up the tools that have become caked with propolis, and getting set up for the next spring. From a financial standpoint, honeybees will set you back a bit. The hive equipment can be several hundred dollars. Smokers, tools and bee suits can be another hundred or two. The bees themselves will cost $150 or more. Altogether that's a pretty big investment to undertake when you can't even be sure if you will be able to keep them alive for the next year. But if you succeed, the income potential is there. You can sell honey, wax, propolis, pollen, and even queen bees and nuc hives, and make a pretty penny doing so. If your back can take it, that is. A full box of honey comb can weigh 90 pounds. If the thought of having to lift an angry, stinging, sticky, dripping box that weighs as much as a 12 year old boy sounds fun, then this is the job for you! A tree frog visits one of my native bee houses. If, however, you find yourself hesitating, don't fret. There is income potential in the native bee world as well. It isn't as glamorous, but it also requires far less of you in terms of time, effort, and finances. You can start your first native bee hotel for as little as $15 if you use a recycled coffee can for a house. You can expect to spend about an hour the very first time you set up a bee house. With practice it takes about 3 minutes. There are no inspections required, no pests that would require chemical treatment, no queens that need to be replaced. I did, once, have to build a cage to protect a bee house from a squirrel that thought they looked tasty. And I have had to remove a bird nest from a bee house. And I have a tree frog that likes to sit on top of my nesting materials that I have relocated three years in a row. (Okay, maybe they were 3 different frogs). In the fall, the native bee nesting materials or eggs need to be be brought in to a safe place until spring to protect them from predators and predatory insects. The process of getting them ready for winter may take an hour for most people. Once you have a lot of bees it will take longer, but still nothing compared to their cousins. Bonus: native bees don't sting! And the lifting requirements are weighed in ounces instead of pounds. So what can you sell if you raise native bees? Bees, for starters. Native bees lay eggs, which are spun into cocoons. The cocoons can be sold locally to help get others started. Some companies, such as my affiliate partner Crown Bees, even offer a "buy back" program where you can mail cocoons to them, and they will mail you a check in return. Money can also be made by selling houses and nesting materials for these bees. So as far as income potential goes, any bee will do as long as it fits in with your idea of a commitment. Mason bee cocoons being harvested from a lake bed reed. When you think of products manufactured by bees, the first thing you picture is honey. So it seems likely that some folks may want a hive of their own just so that they can have a massive amount of honey all to themselves. Native bees do not live in hives. They don't produce wax, and they don't produce honey. If it's honey you want, honeybees are your bees. Just keep things small, if you can. (Please, and thank you.) Packing many hives together in one place contributes to the spread of diseases amongst hives, and allows them to out-compete the native bees for food. 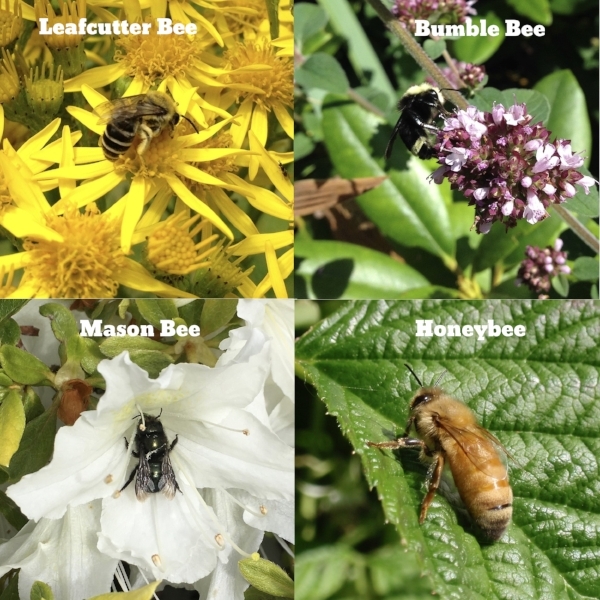 So now that you know which type of bee you would like to raise, how do you get started? That will be tackled in a future blog post. Until then, feel free to comment here with your questions or reach out to me directly.